The Parachute Landing Fall technique is known in skydiving as the “PLF”. 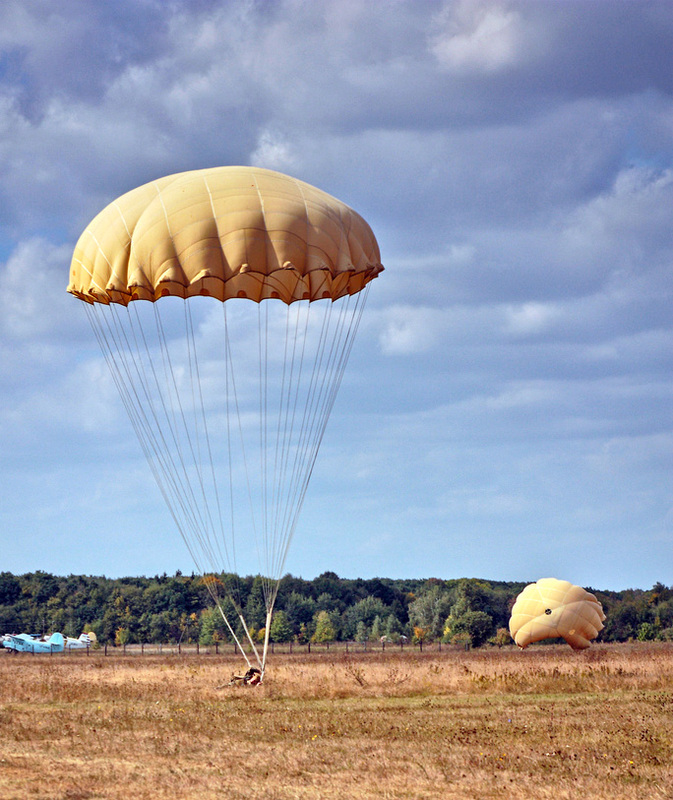 It was invented when an actual fall was the only way to land from a parachute jump. These days, since our square-parachute landings are so much softer, they’re only really used as insurance in situations when skydivers aren’t quite sure of the safety of their landing dynamics. Long ago, round parachutes were the only method to get from airplane to (hopefully) grass. These days, these round canopies are used almost exclusively for military and cargo applications — for good reason. 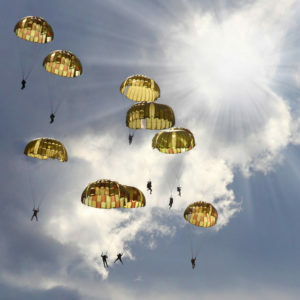 Though “Para Commander” parachutes had design details that allowed them some forward speed in no-wind conditions, their meager parachute landing speed was canceled out by an opposing breeze as light as 10 MPH. Using that as an example: ten miles an hour forward minus ten miles an hour equals…zero. In other words, they were looking at a straight-down descent. In skydiver’s terms, we call that a “dump-in” (as opposed to a graceful, swoopy, birdlike set-down). Since the round parachute technology couldn’t “help out” in the way that a modern square can, this kind of parachute landing broke a lot of ankles. Skydivers had to come up with a way to distribute the smacking they got from the ground, so they invented the parachute landing fall. For reals, though – a good PLF still saves the day with some regularity. When you earn your solo skydiving A-license, proper PLFing will be one of the first parachute landing tips you’re learning. The PLF basically helps you, brave solo skydiver, to roll your way to the ground, tucking your breakable bits out of harm’s way when you’re landing somewhere nopey, in a manner that’s no-bueno or in wind conditions you just can’t win. Decide to make a parachute landing fall as opposed to a normal landing. Make your choice to PLF as early as possible. If you’re landing off, you’ll need to land as accurately as possible. Make peace with the fact that you’re going to be rolling in whatever you see there. Oh – and if your canopy is compromised in any way, definitely PLF. Left or right? Make the call. Most of us favor one side, but parachute landing fall technique ain’t picky. You can execute your PLF to the right or left, and you should consciously decide to PLF away from any unevenness and/or obstacles in your path. How? Point your toes in the direction of the obstacle. That won’t seem right, but doing so will set you up to roll away from it. Run it over in your brain. It’s going to happen pretty quickly, so make sure the information is fresh. Because you’re going to be landing in a coordinated crumple, you need to be as soft-but-springy as possible. Softness helps your body resist the impact without tension, but you still need to have enough muscle stuff goin’ on to pilot your canopy successfully through the flare. Tension makes you brittle. When you PLF, any limb that pops out to break your fall is going to take 100% of the ouch. Don’t let it. Pull your body consciously towards the midline, as though you were in a mummy-style sleeping bag. Pilot your canopy and complete the flare with your arms held closely in. As soon as the balls of your feet touch the ground, hug your elbows tight to the side-front of your body and keep your upper arms to the midline to protect your chest, throat, and organs. Go get the mud brush from the hangar. Scrub scrub scrub to remove the dirt from your container. If you PLF’d like a boss, only your ego will be injured, and everyone else will forget your undignified landing before green light tonight. Honestly, most landings these days are soft, sweet and parachute landing fall-free. Our modern square parachutes give us greater control of our flight patterns and slow the speed of our parachutes’ descent significantly. Nowadays, we enjoy soft touchdowns 99% of the time – just like the tinkerbell-tiptoe landings you’ll see when you skydive with us. So come and jump with us! What is Head Down Skydiving?